Today, guests will arrive at one of the there major airports in the New York City Area (JFK, LGA, EWR), where they will be met by a tour guide at the baggage claim (from 4/1/2016, there will add another two pick up place: Flushing and China Town). There is a complimentary shuttle service from the airport to the hotel. Guests who arrive at JFK or LGA before 3:00pm have the option of joining a tour in Flushing, Queens. Those arriving at EWR before 12:00 can go to the Jersey Garden Outlets Mall for an additional $10. All who arrive before 4:30pm can join an optional Night Tour of the city. In the morning, we will head north to the Corning Glass Museum in Corning, NY to learn about the history of glassmaking. 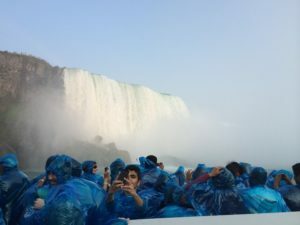 We will then continue on to Niagara Falls, NY where we will take the famous Maid of the Mist boat ride (or Jet Boat), see A Native Journey: The Spirit of the Mist. 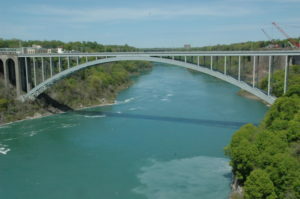 Guests can then choose either to stay in the park for self-exploration or have an in-depth tour that includes visits to the Whirlpool State Park and Old Fort Niagara. Prices are subject to change without prior notice. If you would like to join the optional activities, please pay the fee in cash to the tour guide. You cannot buy / use the tickets on your own or use City Passes. The tour guide will arrange the tickets for the group. 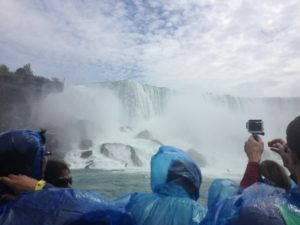 The tour will either go to Maid of Mist & Niagara Falls Adventure Movie (US side) or Hornblower Niagara Cruise & Niagara falls Imax (Canadian side). Depends on traffic and attraction open time.